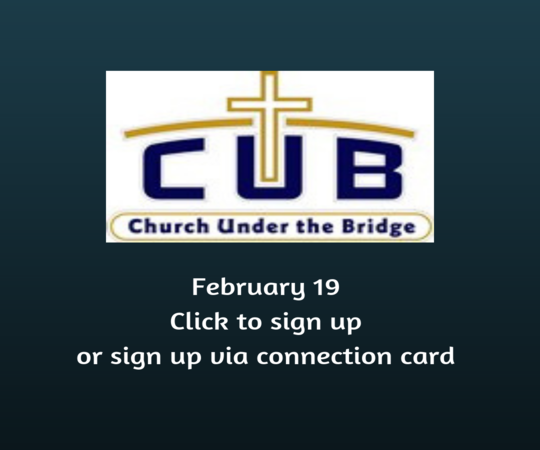 We love our partnership with Church Under the Bridge! Church Under the Bridge is a ministry in San Antonio that loves the homeless community of San Antonio they provide church services, small groups, trainings, food, clothing, and so much more the homeless of San Antonio. Once a month CrossRoads gets to provide the service and sponsor the food and provide volunteers to serve the ones in attendance. That is where you come in! If you are interested in serving the homeless with us sign up in the foyer on a Sunday morning or via your Connection Card a Sunday morning. Spots are limited a every month so make sure you sign up!